Every bicyclist needs a portable multi-tool for quick mid-ride repairs and adjustments, and if they've already got one, well, they probably need a spare! Which brings us to our Stocking Stuffer bicycling gift idea of the Day! 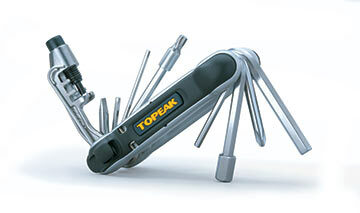 The Topeak Hexus II multi-tool is ideal for both mountain bikers and roadies. It features: 2mm, 2.5mm, 3mm, 4mm, 5mm, 6mm and 8mm Allen wrenches; Phillips and regular screwdrivers; a Torx T25 for disc brakes; a chain hook; a universal chain tool, and 14- and 15-gauge spoke wrenches. Packing more tools into its space-saving design, the sides of the Hexus II are actually two removable tire levers. In stock in all three Century Cycles stores! We've got a wide selection of tools for any rider or the home mechanic from popular brands like Park Tool, Blackburn, Crank Brothers, Giant, and XLC! Remember that you can get the best deals of the season on all of these tools, plus clothing and accessories, now through the end of the year with our "Oh What Fun It Is To Ride" Holiday Sale!